Help the little ones take the lead this back-to-school season with delicious and fun snacks. 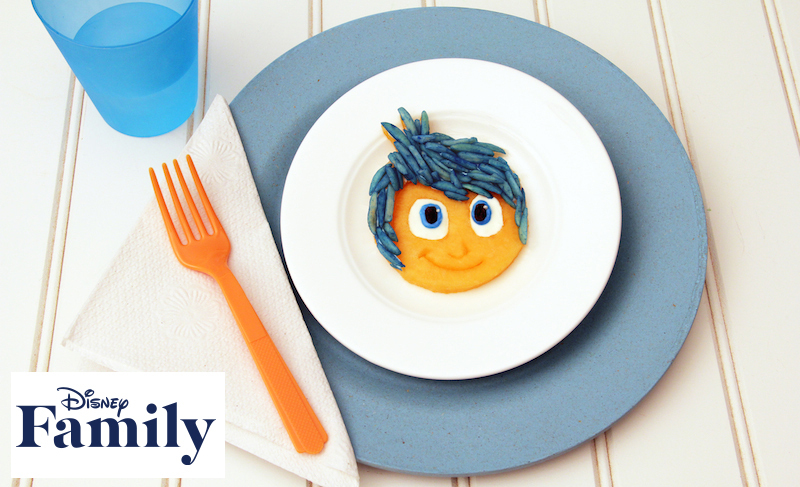 Bring a little “Joy” into the mix with fun food art featuring the leader of Riley’s emotions from Disney’s new movie, Inside Out. Joy may be tiny enough to fit inside Riley’s mind but she is a big part of her happiness and she can be a part of our happiness with this delicious recipe. Trust me, the tummies will thank you and the smiles will show. This recipe is found on family.disney.com. It takes a little prep work before it can be created, especially if the little ones are going to help put it together, but it is worth it. Just be sure you (the adult) do all the cutting, and that the crafting is supervised. 2. Measure the almonds into a small plastic sandwich bag. Dip the end of a toothpick into the blue food coloring and then stir the coloring with 3-4 drops of water (you can do this right in a tablespoon). Add the diluted coloring to the bag of almonds. Gently massage the bag to tint the nuts as evenly as possible. Repeat this step if needed, but don’t tint the nuts too dark. Spread the almonds on a small plate and allow the dye to dry for a few minutes. 3. Meanwhile, cut off the rounded surface from one side of the cantaloupe to expose a large flat surface, as shown. Then, cut a ½-inch thick slice from the melon. 4. Place the parchment paper “hair” template atop the melon slice for a pattern and then use the tip of a sharp kitchen knife to cut out a matching piece from the cantaloupe. Use the “face” template in the same manner, additionally cutting out the eye openings. (Note: If there is not room enough on the original melon slice, you will need to cut a second ½-inch slice.) Finally, use the tip of the knife to score mouth and nose lines in the melon face, referring to the template for placement. 5. Place the melon face on a serving plate and fill the eye openings with 1 teaspoon of whipped cream cheese (½ teaspoon each). For the irises, use the toothpick to stir a very small bit of blue food coloring into ½ teaspoon of cream cheese. Use the toothpick to spread the blue cream cheese into oval iris shapes, about ½-inch long, positioning it close to the inner edge. For each pupil, snip a tiny piece from the raisin and set it atop the iris. Finally, use the clean end of the toothpick to add a small round “glint” of white cream cheese to the edge of each pupil. 6. Spread a thin layer of white cream cheese, about 1½ teaspoons, atop the melon hair shape. Then set the hair shape on the plate immediately above the face so that the two pieces fit together. Lightly press individual tinted almond slivers in place atop the cream cheese to complete your Joy treat.